From the time she first arrived at our home, Ellie has dined on nothing but Blue Buffalo. I knew that Purina made Puppy Chow but I was amazed at how serious Blue Buffalo was about providing the correct food for the one's precious pooch. So she started with "Small Breed Puppy". Then she grew into "Small Breed Adult". When she became a little more "robust " in size we moved to "Small Breed Weight Control". A few years ago Blue Buffalo came out with their "Wilderness" formula that contains no grain. Naturally wanting the best for her, Ellie was moved to "Wilderness Small Weight Control". At this point I was told this was ridiculous that I was feeding her this food, when Costco's dog food was highly rated by Consumer Reports and much less expensive. My defense was that at 1/3 a cup twice a day, it took her a long while to get through a medium size bag of food. And, the way I calculated it, my dog food bill was less than that for Lily, the adult Airedale who was on Costco's premium food. But, I digress. The same was true when Marshall came along. By that time Ellie was back at her racing weight, so they were both on "Small Breed Adult". Of course Marshall had all types of supplements, as well as a dehydrated high fat food, added to his dish to bulk the poor soul up. After all he arrived just a waif of skin and bones. Since then the dog food industry has gotten even more serious about developing food that is targeted for specific breed sizes, ages, weights, and other needs. At any point I expect to find a category for tail length. Then Ellie will be a on diet of "Small Breed Adult Docked Tail" or more likely "Small Breed Adult With an Attitude." Some in my household are convinced the industry has moved from scientific to monkey dust. All I can say is that my two dogs consume small amounts of dry food, are extremely healthy, have bright eyes, good coats, and bushy tails. Well, that was until several weeks ago when while in a Petsmart, in my humble opinion, the industry jumped the shark. Eukanuba and Royal Canin now offer "Breed Specific" food. So your Chihuahua will have the proper nourishment he needs and not suffer because he is having to consume some dog food developed for a Dachshund. Yes, folks, this is where the monkey dust, smoke and mirrors, and make believe come in. Oh, there are differences between the nutritional needs, not to mention the kibble bit size, of a Labrador Retriever vs a Small Poodle. That makes sense. And, "Weight Control" makes perfectly good sense to me, as well as "Older Adult". But, I have issues buying into "Breed Specific". Besides none of this is going to help me. So far I have yet to see a bag of "Norwhat Specific Food". But, have no fear, with today's technology for a mere $100 or so, you can have your pup's DNA tested and learn exactly what you have on your hands (or not). A young lady working in a animal shelter I spoke with explained to me that she had her lab mix (that she had adopted) tested and found him to be 20% Husky, 10% Great Dane, 60% (some kind of) hound, and 10% lab. Given he was only 6 months old, the jury was still out as to which traits would dominate him outcome. We have always had pure breed dogs - Scotties and Airedales - until Ellie came long with her questionable past. Of course no one can start to guess Marshall's pedigree, or lack thereof. My question is will the dog food we once thought as "Premium" now be deemed "Mix Breed" and moved to the bottom shelf like a red headed step child. I doubt it. Like the DNA test that can be done on our pups, I would be interested to see the makeup of each of these "Specific" foods. After all monkey dust is monkey dust, no matter what you call it. I started posting my "Charleston Door of the Day -Photo"s soon after I settled in down here. This past weekend I was out and about very early Sunday morning and found some more interesting images to add to the collection. Lately, I have had to get organized and make sure the doors I have posted are moved into the "Done Door" file and the new images are in the "New" file. As I organized files this weekend, I started counting. I was shocked to see that as of this morning I have posted 128 photos of Charleston doors from one end of the peninsula to the other. Naturally I was not organized enough to note where the doors were that I photographed so I live in fear that I may post the same door twice. Trust me, it is not as much fear as it is embarrassment. Seriously, I doubt anyone is going to take away my birthday if I repeat a door. How very arrogant on my part to think someone would notice . . . or even care. But, I still have my pride. It is not like there is a section of the city that is populated by peach colored homes with white doors, or specific blocks that are known for their green doors. Just because yellow is a very popular color for houses, no two of their doorways are the same. Last week I stumbled on a lovely purple home. Charleston is definitely detailed and colorful. But the doors do not have to be bright yellow or on an orange house to have character. Often I will find in looking closer over the images I have taken that the features on a black door set on a white wall on a door I have walked by a dozen times and never paid any attention to, are detailed and often ornate. It is often here I find the most elaborate carved woodwork in the pilasters, pediments, and delicate brackets exhibited in their doorways. One will miss these fine details of Charleston's architectural abundance unless you stop and look. Of course the missing panel, peeling paint, crooked doorway speaks for itself. The humor is in the details such as the new satellite dish sitting atop a small house that is falling down, nailed shut, and marked with signs stating "Keep Out". Or one that shouts alliteration with a purple bicycle leaning on the front steps, a purple LSU banner in the window ,and other purple features. So what started as, "Now, that is an interesting door, I think I will photograph it and share it," has become a matter of remembering where I have been, what I have seen, and which ones I have shared. The initial idea was doing something that was a no brainer - actually, there was no idea, no plan. Now my innocent idea has a life of its own. Oh, there are plenty of doors, I shall never run out of subjects. And there is certainly enough variety to please most folks who tune in. People stop me (some I do not even know) and tell me how much they enjoy my daily indulgence. Some ask if I find a door each morning to post - the honest answer being, no, I am not that organized in the morning. Others ask where a specific door is - sometimes I can remember, others I have no clue. I have had requests for the more "grand" doors South of Broad as well as some who are humored by the doors that have seen their better days. At the end of the day (or rather first thing in the morning) it comes down to the fact that I enjoy strolling the streets of this lovely place, I fancy myself as a photographer (or least my camera makes me look like I play one on TV), and I thought it interesting to share these particular portals that have piqued my interest. I see this as taking friends along on a stroll through these old streets. All I ask is that if you especially enjoy one or more of my posted portals, that you "Like It" so I will know there is life out there along with me for this constitutional. I need to get out more. I am so far behind the times. Little did I know that I could loose 12 pounds in a week with this new miracle diet, in only 2 weeks I could rid myself of belly fat, and it had been exposed that the NASA used aliens in the space station. Seriously? It gets worse. Ben and Jen are back together and expecting a child. The palace has a plan to destroy Will and Kate's marriage. And, did you know Beyonce had a big secret. Did not know. Did not care. And to think I learned it in the check out line! How do these publications stay in business? Who believes this nonsense? No one with a sane mind would buy one of these, right? With the slate of candidates for the presidential election going to Hell in a hand basket, our men and women giving their lives everyday over seas to fight militants who have declared jihad on America in an undeclared war, and a generation of 50 somethings who have found themselves shut out of the work force - do we really care that some a 20 something with a photo-shopped body, a pea brain, and famous for only being famous was found "stepping out" on her boyfriend? The irony of the "Miracle Diet" was that it was second line on a magazine cover just blow the full color photo of a five layer chocolate fudge tort that touted "You can make this in just an hour". Many of the "stars" they mention on the covers of "The Star", "Us Weekly", "The Sun" (UK), "The Daily Star (UK)", "The Daily Mirror" (UK), "The New York Post", "The Daily News", and the 300 pound gorilla - "The National Enquirer" I have never heard of. This is just one more reason I prefer the "Self Check Out" lines at the market - they spare me being subjected to the walls of this reading material of mindless made up trash. Only the 1st amendment keeps these scandal sheets, tabloids, sensational journalist, gossip columns, and general disseminaters of untruths at bay. But I can only imagine how much they pay in legal fees every year defending libel and defamation suits. Yesterday while I stood in line waiting for a customer or two ahead of me, argue with the cashier over whether her coupon would discount one can of fruit or the fifteen she was trying to purchase, I was caught in the canyon of rubbish. Naturally my eyes were drawn to the distorted the pictures, the 18 inch waists wrapped with a measuring tape, the ever promising by-lines, and trashy headlines. Seriously, who buys this crap? As that thought went through my mind, a fleshy hand reached from behind me and picked a copy of "The National Enquirer" off the rack. I turned to see a 250 pound lady dressed in a floral moo moo, wearing bedroom shoes, with twenty tiny cans of dog food (no doubt for her tea cup poodle named Fi-Fi), a box of donuts, and several boxes of frozen pies in her cart. She put her glasses on, the ones attached to the beaded string around her neck and exclaimed, "I just don't know why she would have married him in the first place, God knows the number of beds he has put his shoes under." No doubt she drove some over sized older land yacht, lived in a trailer park, and believed Elvis was still alive. Well, another mystery of the universe is answered. 21 Plus 35 Can Never Equal More than 39, Right? By the time you have your 35th college reunion, the Alumni Association figures that you should be successful enough to fall into the category of "Potential Donor". I am sure that was the thinking when it was announced that our class's private reunion would be hosted at the President's home on campus. And, when I learned the soiree would be in the lovely garden rather than in the house, I assumed that even after 35 years they thought it best to keep us out of the house lest we break anything of value and to keep them from having to put away the fine silver. But I digress. If you not familiar with the College of Charleston, the focal point of the campus is the lovely Cistern, a walled in area under ancient live oaks in front of Randolph Hall. This is the setting for graduation. And the breathtaking southern beauty of this local has ranked CofC on the list of The Top Ten Most Beautiful Commencement locations. 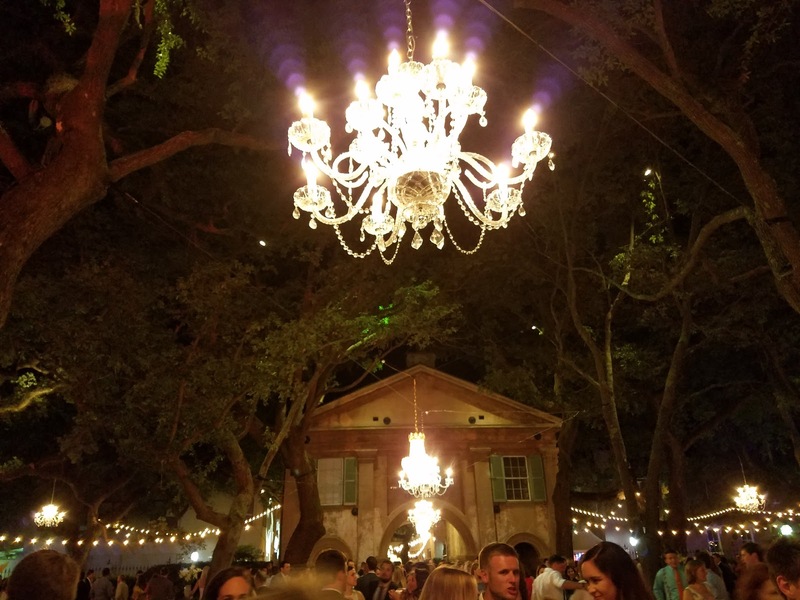 It is just as gorgeous for the Charleston Affair, the Alumni Reunion for all classes hosted under the oaks the Saturday night prior to graduation. Since 1900 this event has taken place. And as the college has grown, so has the celebration. Now, crystal chandeliers magically hang from the oak trees, Randolph Hall is bathed in colorful lights and the lawn under the oaks is graced with linen covered tables where alums and their guests can enjoy the food and beverages being served from the many white tents set about housing food stations and bars. A band plays on the large elevated stage that has been put up in preparation for commencement. When I first arrived Saturday night I walked into the Cistern to see this incredible sight. I had seen pictures of the event in the past, but seeing it live and in color was a something I found amazing. Walking around, it was hard to take it all in. This is the 13th oldest college in the country and this area has sat basically unchanged in all that time - how special is that? But, my classmates were down the street at the elegant President's house where we were being feted our own private event. There would be time for the big party later. As I walked down Glebe street I saw folks filtering into the President's gates. None of them looked familiar. In fact looking at them, it dawned on me that several classes must have been assigned to this venue. We were the class of 1981, this looked like these folks may be the classes of 1971 or maybe 1966 (for their 45th and 50th reunions respectfully). Scary thought - in only 10 years we would be celebrating our 45th and look like them. But, they were pretty spry for their ages. A good friend of mine was greeting everyone as we entered the garden. It was only then that I realized, no, this was just our class. These were not the classes of 1971 or 1966 - these were my classmates. These folks that I had pegged as in their mid to late 60's were my peers. Dear God, we were all old. Let's see we were 21 years old when we graduated, and 35 years later, um that is that "New" math that never adds up correctly. Hell, instead of the young friends I remembered and looked forward to catching up with, this was going to be a group of grandparents. In my mind I was still that young girl who came to Charleston in 1977. Granted I had a better hair style, much better taste in clothes, was a bit smaller, a bit grayer and more wrinkled than I was then. I just didn't see myself as being that "old". Maybe I was in denial, if so, I would keep my head in the sand. If you are as good as you feel, I was doing pretty well. At least I could keep the charade going in my head, if I just didn't choke on the sand. One great advantage of living where I do is rarely having to drive (with the exception of to and from work - which is a delightful 6 minute commute against traffic). This is especially convenient when I am meeting friends for dinner or drinks. Since upper King Street with its many excellent bars and restaurants is just a few blocks away, a simple stroll will deliver me most places I need to go. If the destination is a bit further on the peninsula, Uber is a life saver. Between the traffic downtown, parking nightmares, and my absolute refusal to enjoy adult beverages and then get behind the wheel of my car, a $4-$5 fee for a friendly driver in a clean car to pick me up just minutes after I place a request and safely deliver me home is a bargain. Often this fee is equal to what I would have paid in parking fees. Lately I discovered another option to get around downtown - the city offers a free trolley service. There are 4 loops that run continuously covering different areas of the city from 7 in the morning to around 8 in the evening. Since I live only 6 blocks from the Visitors Center, the central location of all the routes, I can easily catch a trolley that will deliver me within blocks of anywhere I need to go. The trick is figuring out the schedule and timing. For my reunion this weekend, while the College is a walkable distance, trucking down there on a warm evening dressed for a gala in heels was not an appealing thought. So I figured out which trolley would deliver me closest to campus. The King Street line stops at the corner of George, just one block from campus. I figured the time I needed to leave and made my plan. While looking at the chart, I realized that the closest stop to me was not at the Visitor's Center but just a block and a half away. Knowing I would be making my way in heels, this was even better. So at the appointed time I left my apartment, actually 10 minutes early to make sure neither crossing busy Meeting street nor my clock and the trolley driver's clock not being synced did not cause me to miss my ride. As I approached the stop, I realized perhaps my plan was going to be even more interesting than I first thought. While the trolley was designed to move tourist throughout the city, locals (like me) use it to hop on and off while moving through the town. Even though this stop was beside one of the newer Upper King hotels, the patrons waiting at the stop, well let's just say they were not dressed for a semi formal gala attire. Of course this stop also serviced the city bus service that many of the city's lower income people use. So I found myself waiting with 9 or 10 other folks, all very polite. There was a couple, extremely inebriated, oblivious to everyone else around them, a young man holding an armful the traditional roses made from palmetto strips that the tourist buy on the street, a mother with two very young children, a very dapper dressed older man who insisted on giving me his seat, and me, the only caucasian among them dressed in a summer cocktail dress wearing heels carrying a small purse. As I sat there taking it all in, I could only imagine what thoughts were going through their heads. Naturally my luck would have it that no guests from the hotel joined me so a photograph of me sitting there could have been a Norman Rockwell painting - you know Americana always showing someone out of place. Finally a city bus came and half the people waiting got on. In a minute or two (right on time) the trolley drove up. When I boarded, I was not surprised to see most of the passengers were obvious tourists dressed in shorts and t-shirts, many with cameras around their necks holding maps of the city. There were more than a few odd looks as I took my seat. If I were not a 56 year old middle aged woman, perhaps I may have been taken for a working lady of the evening. And, I imagine when they saw me sitting at the bus stop amidst that motley crew, dressed as I was, that thought probably crossed their minds. I got off the trolley at my stop and my thoughts turned to thinking about the reunion I was about to join and all the angst one has walking into such an event. Suddenly the slight idea that I may have even been taken as a strumpet, all be it an aged one, gave me a certain confidence as I walked into the Cistern. Hey, at 56 attending one's 35th college reunion, I'll gather courage from any source.